When a person talks about equity, they usually talk about race, gender, and socio-economic backgrounds, which are major issues, but when we talk about equity we need to make sure to include students with disabilities. According to the National Center of Education Statistics, 12 percent of our state’s students have a cognitive disability of some kind. This is where computer science can be most utilized. Learning this discipline provides minority groups, like those with cognitive disabilities, a chance to couple their unique talents with inventive solutions. As someone who has been around autism all their life—my sister has autism—and through my experience with her, I have seen an array of individuals with disabilities. For example, while growing up my sister and a majority of her classmates were visually-oriented, extremely focused when they were engaged, and incredibly resilient. Whether these students are focusing on a set of problems, going through trial and error, or searching for solutions, these tendencies could be of great benefit to those students learning computer science. The Special Olympics Unified Robotics program is another great example of computer science being used to teach social collaboration. This program, hosted by King’s High School in Shoreline, brings together students with and without intellectual disabilities to form robotics design teams. 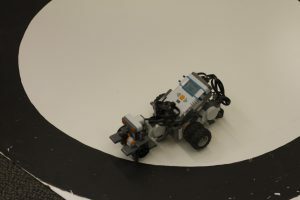 These teams design, build, and program their own robot to compete in a tournament-style competition each year. This program began in 2015 when then-student Delaney Foster noticed that her robotics-fanatic (and also autistic) older sister, Kendall Foster, was having trouble finding robotics education opportunities for students with learning disabilities in the greater Seattle area. Delaney, who is now a college freshman, researched how to start a program through the example of FIRSTRobotics, an international organization that enables young people to build and compete with their robots. Delaney’s idea was a huge success: the Unified Robotics program took off in collaboration with Special Olympics Washington, and has since been adopted up by 11 other schools. With the help of the Pacific Science Center, the competition’s size has now grown to 32 teams. Delaney’s hope is that every school in the state will adopt the program. When I interviewed a few of the program’s student participants, their comments reflected a sense of insight and transformation that came from their interactions with special-needs peers. For many of those students, this was a first-time experience. Students spoke of new ways of thinking and new perspectives on how to work beside individuals who are different from them in order to solve real-world problems. One student mentioned that a unified robotics athlete she works with had ambitious plans for the design of a robot they were working on together. She tried to explain to the athlete that it was going to be impossible for them to build the robot with the design he wanted, while also having it function. But the athlete was determined to create his design, and he found a way to preserve his plans while also having the robot function perfectly. The student said s he admired the athlete’s tenacity and determination to “think outside the box.” Another student mentioned that she felt it was important to include students with special needs because they bring a different perspective to problems that the other students wouldn’t have thought of before. She also said that students with special needs are the same as people without disabilities; they should be given the same opportunities. Through Greg Bianchi’s work and through the example of King’s High, we can see how vibrant student lives quickly become when computer science is opened to students with disabilities. As Greg said, “giving kids in special education the opportunity to engage in computer science experiences is incredibly important because equity calls for it.” As technology grows, we need to make sure our students are computer literate, especially as tech companies like Microsoft establish new hiring practices to bridge the equity gap. It is up to us to make sure that we are preparing students of diverse cognitive abilities for the new opportunities that will be available to them in the future, and computer science education opens countless doors to do just that.